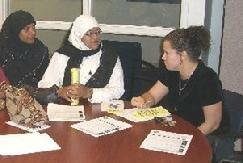 The Florida Commission on Human Relations in partnership with Florida Atlantic University, held an Interfaith Symposium on Wednesday, October 29th, 2008. 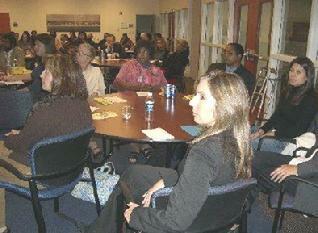 This event was held at Florida Atlantic University, Fort Lauderdale Campus. This peace building event helped educated attendees about the growing trend of hate crimes and religion-based discrimination occurring in South Florida. The event was organized by Hon. Evelin Ramirez District IV Representative for the FL Commission on Human Relations. Shaikh Shafayat and Rabbi Zev Katz of Chabad House Synagogue, Miami Fl. were guest speakers at the symposium. Photos Above Top Left: District IV Representative for the FL Commission on Human Relations Hon. Evelin Ramirez, who is the Community Assistance Specialist of the Florida Commission on Human Relations in Tallahassee, Florida. She was the moderator for the Interfaith Symposium. 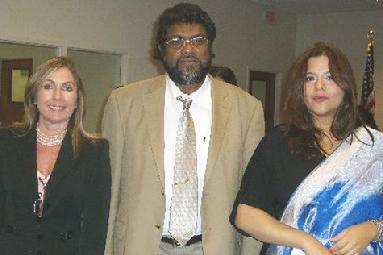 Photo Above Left: Professor Maria Santamarina is a professor at Florida Atlantic University. She is also the Co-Chair of the University and is also a Diversity Officer of the Diversity Community. Middle: Shaikh Shafayat who lectured on the importance of Interfaith Dialogue, and diversity in a multicultural society. 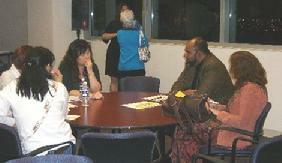 Brothers and sisters from the Muslim Community who attended this event were, Bro. Wayne, Sis. Karen, Sis. Nadira, Sis. Azra, Sis. Faria, Bro. Anwar, Sis. Humara, Bro. Sajjad, Bro. Siddique, Sis. Stacy & Sis. Salma. They shared their views and thoughts to other non-Muslims about hate crime and the importance of preventing discrimination in communities.